White continues to deliver on action-packed space adventures in a strong, satisfying sequel to A Big Ship at the Edge of the Universe. 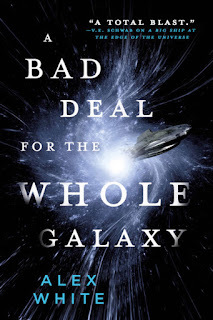 A Bad Deal for the Whole Galaxy opens one year after we last saw the crew of the Capricious, having hunted down the big ship at the edge of the universe (also known as the Harrow) and started to uncover a galaxy spanning plot. Like it's predecessor, Bad Deal doesn't waste any time, throwing its audience right into the middle of things. Former racecar driver and rich kid Nilah Brio is still running with the crew of the Capricious under Captain Cordell, trying to pick up agents under the control of the first book's Big Bad. Unfortuantely, while they've had some luck mopping up, they're much less able to pick up a live person to interrogate. Of course, we've joined the Capricious at this moment for a reason, and obviously that reason is because they're about to go and pick up Elizabeth "Boots" Ellsworth, one of the few people in the galaxy born without magic, who left the crew again at the end of the previous book to retire to a nice quiet planet and farm whiskey (or something). Obviously this retirement does not survive contact with the gang, who get extremely drunk and convince her to come back for One More Job - again. Through their initial running around and a convenient pre-death monologue from an early target, the Capricious crew uncover information that leads them to the Children of the Singularity: a cult of hyper-libertarian space nationalists who hate weakness, intergalactic peace institutions and the Capricious crew. The Children are manipulating the galactic internet to create false information about the Capricious and generally redefine galactic history to their own ends, and appear to be at the heart of the conspiracy involving Henrik Witts and the Harrow, so they are clearly in line for taking down. Honestly, the "whys" of what happens next don't come across as particular integral - there's a powerful magic artefact involved, and figures from Boots' past and from the destruction of Clarkesfall, the planet from which many of the crew hail from, play roles, but at the end of the day it feels like we are infiltrating the angry-boy death cult, with all that it entails, Because It Is There and That's What the Capricious Does Now. I'm on board with that. White's mixture of magic and science fiction continues to be very enjoyable. The basic premise is that almost everyone is born with a particular "mark" which allows you to do a specific type of magic, from "hoteliers" who are really good at cleaning to "mechanists" who can talk to and hack machines to "readers" who can extract memories and truths. Inevitably, the villains end up with less savoury powers, ranging from bit players who get to shoot lasers out of their hands to the "gods" at the top the conspiracy the Capricious are attempting to unravel, who each appear to have immense powers over time, space and reality. The organ that controls your magic - your cardoid - also basically acts as an identity marker, like a fingerprint or retina would be in our world. The entire technological base of the Salvagers universe is seamlessly integrated with these magical powers, something that means that for a arcana dystocia sufferer (i.e. muggle) like Boots, navigating the world is more difficult at every turn, as technologies simply don't recognise her existence or work properly for her. While this is more often played as an advantage where the plot is concerned, especially where subterfuge is required, White does make it clear how frustrating this must be to live with day-to-day, without compromising on Boots' portrayal as a hardass, resourceful middle-aged woman. The rest of the characterisation is also strong, if occasionally a bit flat when it comes to the ensemble. Nilah Brio has grown up significantly in the year she's spent with the Capricious, and its interesting to watch her increased levels of empathy and self-awareness and to see them bump up against the still far more significant and traumatic experiences of the rest of the crew. Nilah is resourceful and interesting, but she's ultimately still a rich girl palling around with a group of war veterans, refugees and traumatised child experiments. To my excitement, Nilah's relationship with robot-mechanist and quartermaster Orna continues into this book and becomes its own minor but well-done plot thread. Cordell remains satisfyingly captain-y, the rest of the crew get enough development to remind you you're around without taking up much of the action, and there's a new pair in town in the form of Jeannie and Alister Ferrier, twins who have the same magical mark - a genetic near-impossibility in the Salvagers' world - and an obligatory mysterious, traumatic past. On the antagonist side, the presence of "godlike" magic makes the threat suitably terrifying despite the ease with which the Capricious crew seem to cut through some of the lower orders of the Children, and the stakes for the main antagonist battle make for a highly satisfying climax. I've recently been thinking a lot about series and sequels in science fiction and my own feelings about when to continue to invest in a set of books and when to bow out. First books often make me feel more excited for the promise of the series than the book itself, and this makes me want to give series a second or third chance even when initial entries haven't blown me away - with my TBR pile usually expanding accordingly. It's something I can do less now, as my reading time has gone down in the past few months and I need to be more selective with what I use it on. 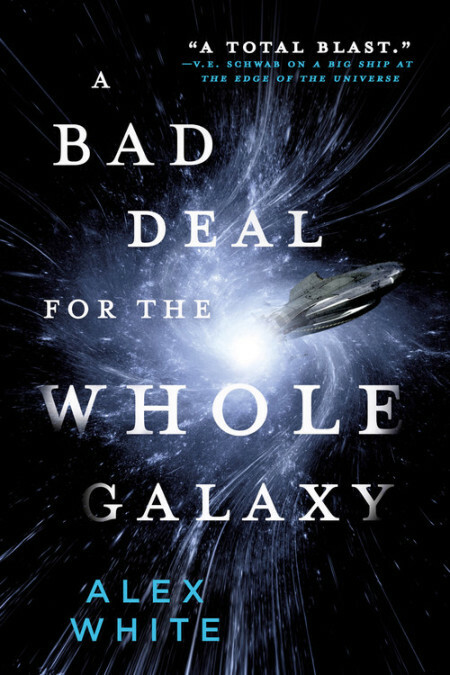 However, A Bad Deal for the Whole Galaxy is the kind of book that bears out the strategy. Where I found Big Ship breakneck to the point of confusion, Bad Deal was still fast paced but easier to follow in its action. Where Big Ship relied a little too heavily on coincidence and inertia to get a particular set of characters together, in Bad Deal everyone has grown into their roles and while there's still interpersonal tension, there's also a lot more weight behind some of the relationships, which you could only get through time spent with the characters. It feels like we're in a golden moment for fantastic, pulpy-yet-self-aware action-heavy space opera, and White's series is a very worthy addition in that current line-up. With a threequel already on the cards for next year, we haven't seen the last of Boots, Nilah, Cordell and the gang, and I'm definitely going to be in line for their future adventures. Bonuses: +1 A sequel experience that really rewarded my attention past the first book; +1 Disabled middle-aged woman protagonist who still gets to be the most unquestioned badass on the team. Reference: White, Alex. A Bad Deal for the Whole Galaxy [Orbit, 2018].